To paraphrase Mark Twain, "rumors of the death of brick and mortar retail are greatly exaggerated." Although e-commerce shopping continues to grow rapidly, brick-and-mortar stores are still holding up well versus online retail sites, as many people still prefer the in-store shopping experience where they can see and try out products before committing to a purchase. Note that nowadays many purchases involve both digital and physical browsing of goods - often a purchase begins with online research followed by a visit to the store to make a purchase, or conversely a purchase may start with a customer examining the product in-store but making the purchase online. And with the prevalence of smartphones and other mobile devices, shoppers can perform their online research and price comparisons while in the store (known as "showrooming"). Free shipping is sometimes available from online vendors. For example, for a small yearly fee the Amazon Prime service includes free shipping on most items ordered through Amazon. 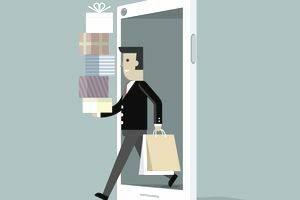 How Can Small Business Take Advantage of Online and In-store Shopping Trends? In today's market, virtually all large brick-and-mortar retailers also have a strong online presence. For small brick-and-mortar businesses, deciding whether or not to spend the time and effort to expand into online sales is less clear. According to Forbes, only about 28 percent of small businesses make their sales through the internet. Given that most people tend to search for businesses on the internet, your business should always have an online presence, even if it consists of a Facebook page or simple website containing your address and contact information, as well as a brief description of your product or service offerings. If you do decide you want to sell your products online you don't have to go to the trouble and expense of setting up a complete separate e-commerce website. Setting up a Facebook or eBay storefront, or selling through Amazon as a third party, is all relatively simple and serve as inexpensive ways to get into online sales. Whether or not you have an online presence, the best way to compete with online stores is to build long-term relationships with your customers by providing excellent customer service. Customers enjoy a sense of familiarity. Being addressed by their first name, enjoying a friendly interaction with sales staff, receiving personalized service and feeling that their needs are being met are sure ways to keep customers coming back. As an example, a good salesperson in a clothing store can be extremely helpful to a customer by providing advice on appearance, sizing, mixing and matching articles of clothing, assistance with fitting, care, and maintenance, etc. Without any customer assistance or the ability to try on an item in advance, the only recourse for an online clothes shopper is ordering an item and hoping that it fits and is suitable, otherwise sending it back by return shipment.